Leprosy was widespread until the late Middle Ages. In the sixteenth century, the contagious disease disappeared almost entirely from Europe, even before antibiotics for medical treatment had been discovered. The genetic composition of the bacterium Mycobacterium leprae did not change considerably over time. Instead, researchers now suspect that the Europeans’ genome adapted. An international research team directed by Professor Ben Krause-Kyora at the Institute of Clinical Molecular Biology (IKMB) at Kiel University came to this conclusion. The research project received support in particular from the Graduate School “Human Development in Landscapes” and the Cluster of Excellence “Inflammation at Interfaces”. The research group, which also consists of members of the Kiel Evolution Center (KEC), published its findings in the renowned journal Nature Communications. Every year, over 200,000 people around the world – above all in Brazil, India and Indonesia – still contract the disease, which can now be treated. During the epidemic in the European Middle Ages, lepers were isolated in special medical care facilities and buried in separate cemeteries. 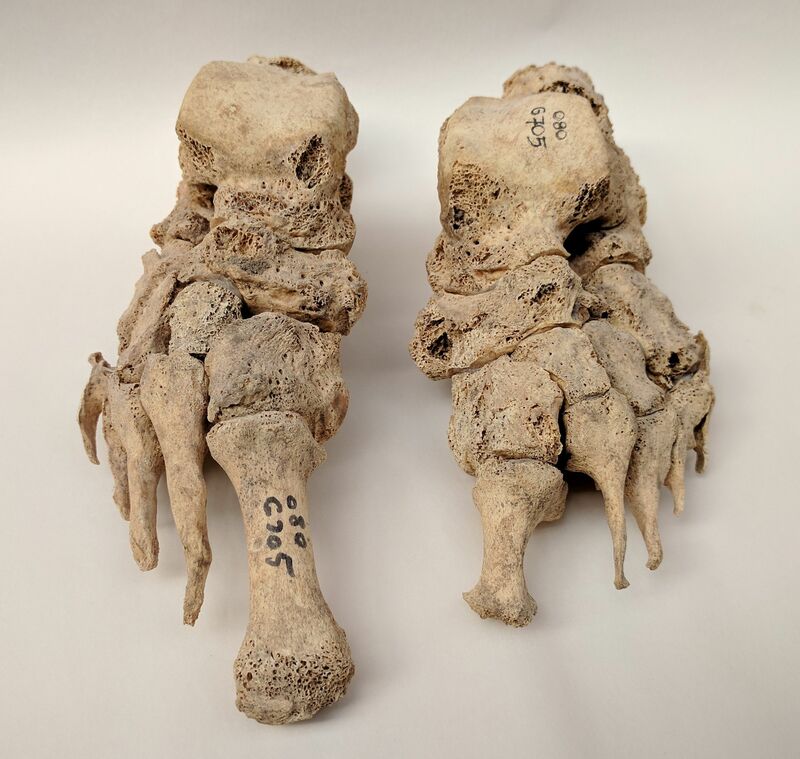 Bones from 85 especially severe cases of leprosy from the twelfth and thirteenth centuries in Odense, Denmark, provided the research team with source material for the first case-control study based on ancient DNA (aDNA). 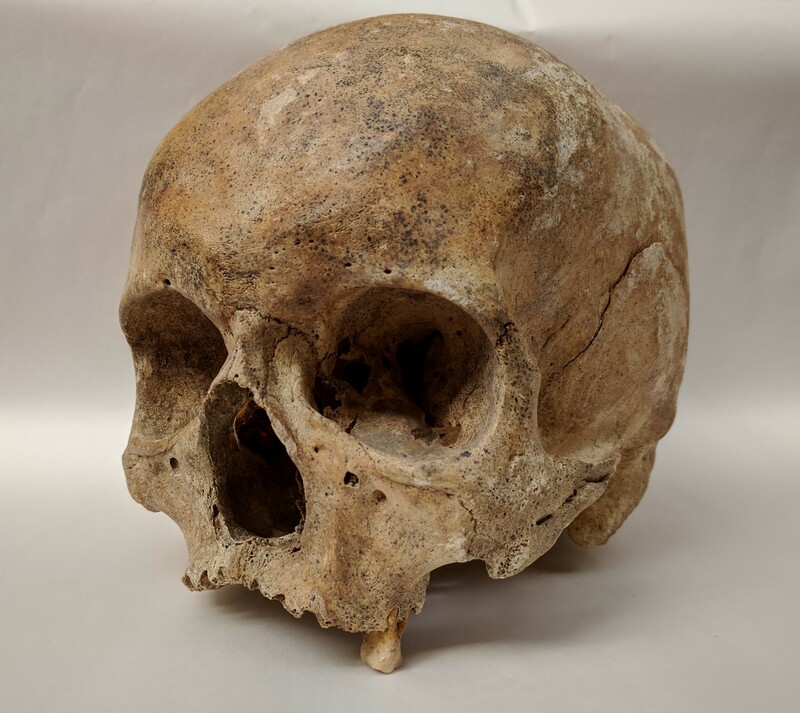 The researchers compared their samples with 223 medieval Danish and Northern German skeletons that did not demonstrate any signs of leprosy. Professor Almut Nebel (IKMB), Professor Jesper L. Boldsen from the University of Southern Denmark and Dr Tobias Lenz from the Max Planck Institute for Evolutionary Biology in Plön played an instrumental role in this work. Scientists from the University of Cologne were also part of the team. Together, they wanted to find out how the disease disappeared from Europe and how this development impacted us genetically. In contrast to modern genetics, there are no automated methods for analysing aDNA. Krause-Kyora reports that examining the archival material from excavations therefore required “manual work”. First, the researchers removed all impurities from the samples from Odense and the State Archaeological Museum in Schloss Gottorf. About 50 to 100 milligrams of material from teeth and skulls were then analysed in the aDNA Lab. Scientists found up to five percent human DNA in the teeth and the detected pathogenic leprosy DNA was only in the parts-per-thousand range. “These really are considerable yields. We had a high success rate because the material is very well preserved,” Krause-Kyora explains, pleased. He is also a co-applicant for the large-scale project ROOTS in Kiel University’s current round of the German Excellence Initiative. The HLA variant is today linked to the appearance of inflammatory diseases, such as sarcoidosis, ulcerative colitis, multiple sclerosis or type 1 diabetes. The HLA antigen causes bacteria to be recognised, among other things, and triggers a targeted immune reaction in the body. The identified HLA variant does a particularly poor job performing this task where the leprosy bacterium is concerned. The body may therefore have a less effective immune reaction. “In addition to genetics, environmental factors also play an important role during the emergence of diseases,” says Krause-Kyora. “Nonetheless, investigating the causes of disease in historic times is important so we can understand the coevolution between pathogens and humans and the resulting changes that have occurred in our genome over time. Our study represents an enormous progress in this regard,” adds Lenz, head of the Evolutionary Immunogenomics research group. Examining additional human genes is necessary. The team has already succeeded in sequencing ten complete leprosy genomes that show there was a very high diversity of the bacterium in Odense. This means that infected carriers brought not only one bacterial strain to Denmark but several from different areas. “A big surprise,” Krause-Kyora emphasizes, seeing as researchers previously knew of only one bacterial strain in the region. In the future, the team wants to research additional medieval diseases in various population groups and thereby trace changes in the genetic composition of Europeans. The research team examined medieval aDNA from teeth and petrous bones, the hardest bones in the human skull. Leprosy is an infection that migrates to nerve cells and causes peripheral nerve pathways to necrotise. As a result, inflammations cause fingers or toes, for example, to rot off. 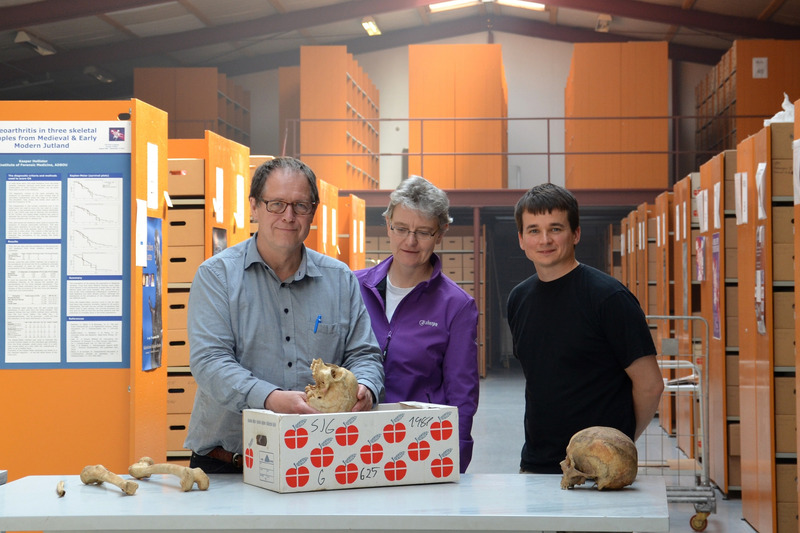 Jesper Boldsen from the University of Southern Denmark (left) explains the bone changes of a woman who contracted leprosy to Almut Nebel and Ben Krause-Kyora from Kiel University.